Have you thought about how renewable energy sources can help you survive (and thrive in) a major societal meltdown lately? 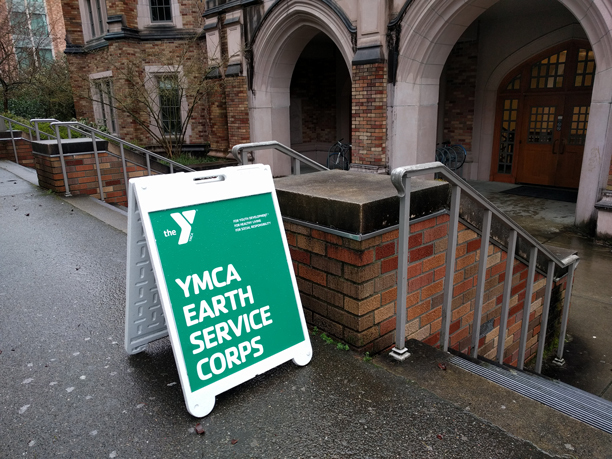 High school students participating in the YMCA’s Earth Service Corps (YESC) Environmental Symposium, held at University of Washington on March 24th, had the chance to do just that. Seattle-area high school students started signing up for their chosen workshops at 9:00am at Mary Gates Hall at UW. AHB’s two workshop slots filled up in no time! YESC was founded in 1989 with the mission to provide environmental education and leadership opportunities to youth. The annual Environmental Symposium, which invites a wide variety of community members to run hands-on workshops for youth, has been a staple of YESC since its inception. This year, topics ranged from making your own green self-care products to using GIS for environmental justice. The spots for 150 high school students filled up so quickly that over 75 students had to be turned away. The AHB Extension Team proposed a workshop on how to make biodiesel, framed as a survival tool in a zombie apocalypse. The workshop idea was so popular among students on the YESC’s Youth Leadership Council that they requested two sessions. To help run smaller groups in the hands-on activity, Extension recruited volunteers from the AHB Conversion Team. AHB team members talked to small groups of students about ways to use renewable energy to survive the zombie apocalypse. The workshop started by asking the students to imagine themselves as “preppers”– people who stockpile goods, equipment, and skills in preparation for societal collapse, in this case a zombie outbreak in major metropolitan areas. They brainstormed ways to use renewable energy to escape the cities, defend new strongholds, and rebuild society. Then the students got to produce renewable energy themselves by making biodiesel! Led by AHB Extension and Conversion Team members, students produced samples of crude biodiesel from vegetable oil. To finish the workshop, AHB team members did a quick demonstration to test the fuel. They coated wicks in the crude biodiesel, cleaned biodiesel, and straight vegetable oil and burned the fuels side-by-side. While all wicks burned, the cleaned biodiesel appeared to produce the hottest, cleanest flame. Extension Team members Noelle Hart and Cat Gowan demonstrate the burning capacity of crude and cleaned biodiesel compared to vegetable oil. They also brought a DIY camp stove made out of two aluminum cans that burns alcohol. 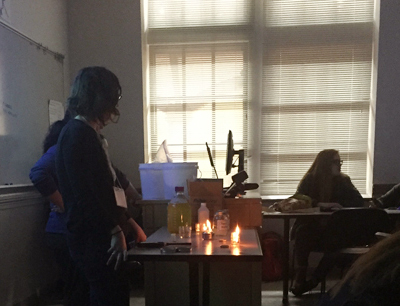 “I could see the interest level of the students grow as the workshop progressed from explaining the fundamental chemical reaction that produces biodiesel to the actual simulation and experiment portion of the workshop. 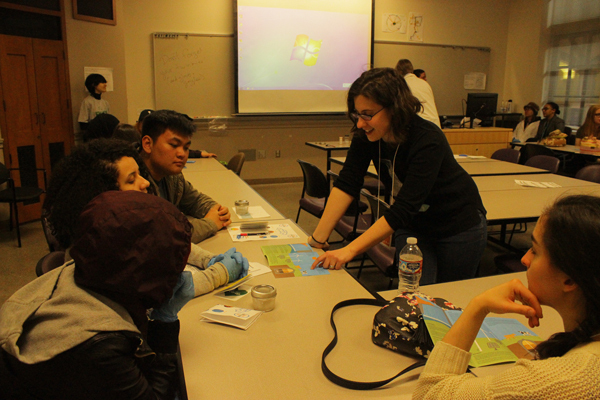 I believe that hands-on, direct experience is always vital in successful education,” says Amira Chowyuk, a graduate student in the Biofuels and Bioproducts Laboratory who also volunteered to help with the event. YESC attracts enthusiastic and engaged students who are proactively looking for ways to improve their communities, schools, and environments. It was a great opportunity for the AHB Conversion and Extension teams to work together and make the conversion process of creating biofuels a little more tangible to a new audience. And if zombies do happen to attack Seattle, at least these high school students are going to be better prepared!